It seems that Oppo is bring the popup camera to its F series of smartphones similar to what we have seen in Vivo Nex. Just a few hours back, we reported on Vivo V15 Pro specifications, which is set to officially launch on 20th February. Vivo V15 Pro features the popup camera from Vivo Nex and comes with a 48MP primary sensor at the rear along with two other camera sensors of the triple camera module. 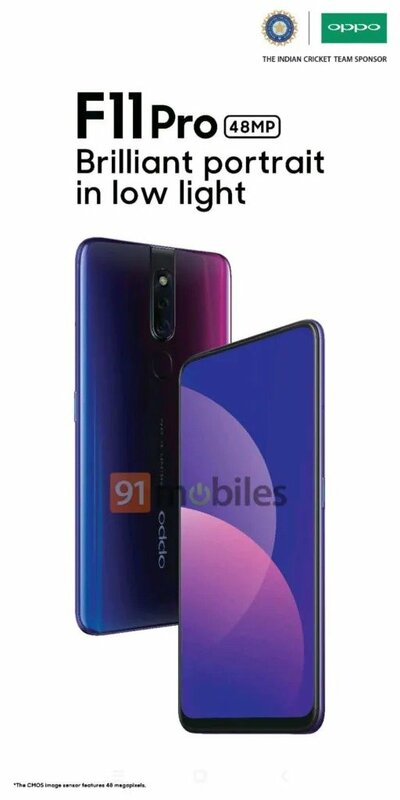 An alleged press render of Oppo F11 Pro has leaked on the web which reveals the 32MP popup selfie camera for the device placed in the middle of the device. Thanks to the popup camera, there is no notch in the display and it comes with a high screen to body ratio. The leak also indicates a dual camera module at rear with a 48MP primary sensor which is basically a 12MP sensor that utilises pixel binning technology to shoot 48MP images similar to Redmi Note 7. The render also indicates brilliant portrait images in low light conditions. The leaked render indicates a gradient hue colour, but you can be sure that more colours will be available. The leaked render doesn’t reveal the details of the second camera sensor at the rear. We can also see the conventional fingerprint sensor on the rear panel which confirms that there won’t be an in-display fingerprint sensor. Oppo F11 Pro Price and Launch Date? The leak also indicates that Oppo F11 Pro may officially launch next month i.e. March 2019. In terms of pricing, there is no detail available but you can expect it to be priced around 25,000 Indian Rupees.